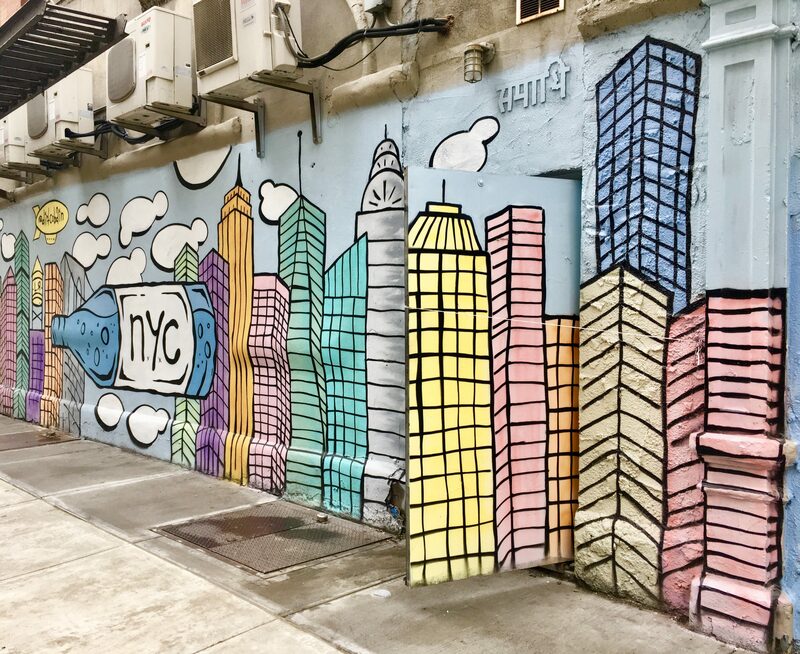 I have no idea how long this pastel-hued NYC Skyline mural by San Framciso-based street artist Dirt Cobain has been up, but my guess is that it’s a couple of years old, based on its relatively decent condition. 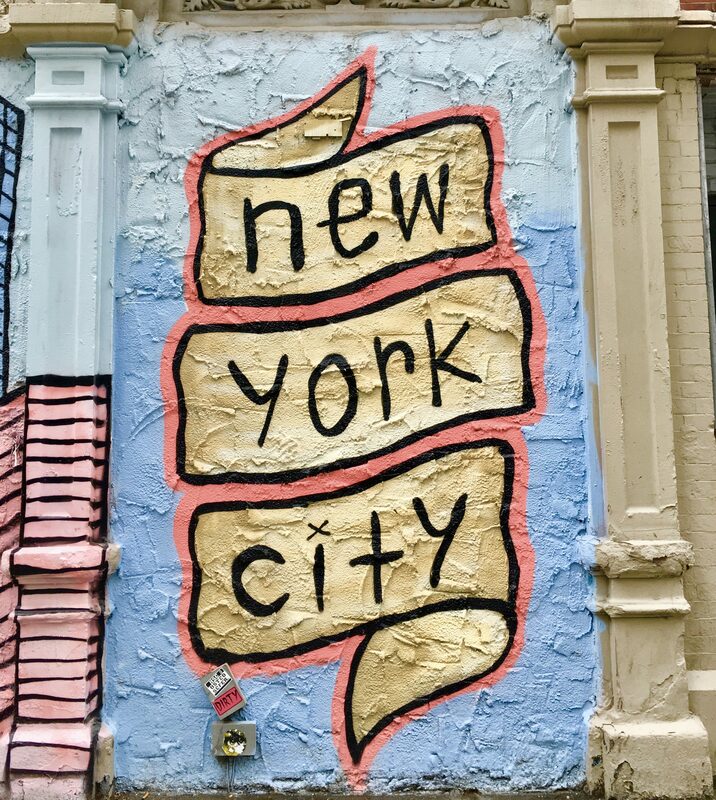 This identifying banner sits at the west end of the mural, which covers the service door of a local business at the southwest corner of West 24th Street at Sixth Avenue. Next time I walk by this street, I’ll try to a get photo from across the street, when business has its door shut. Wedged between viewing rad new art by both Lynda Benglis and Herb Alpert, we popped into Jim Kempner on 23rd and 10th during last Thursday’s Art Crawl to check out a very fun exhibit. 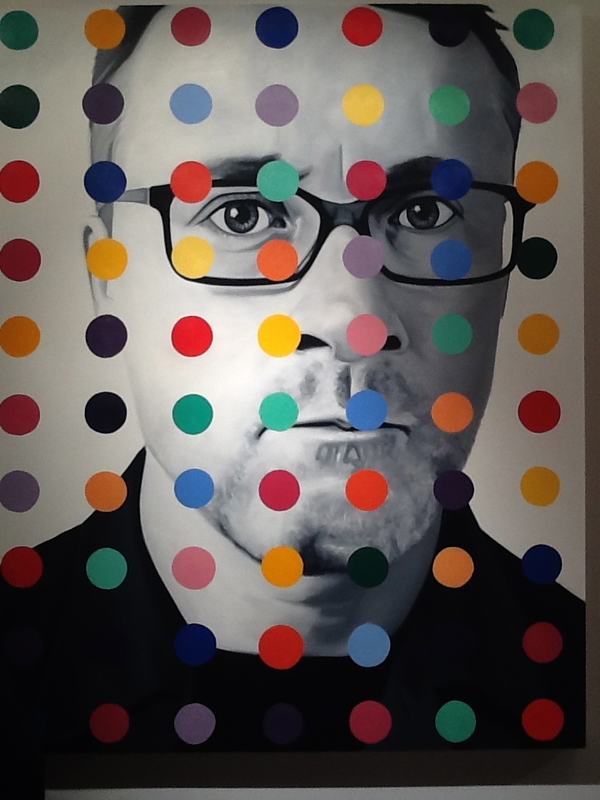 Taking Appropriation Art to a hilarious new level, painter John Grande presents his new series of portraits depicting pop culture icons superimposed with the distinctive design of Damien Hirst’s famous Spot Paintings. 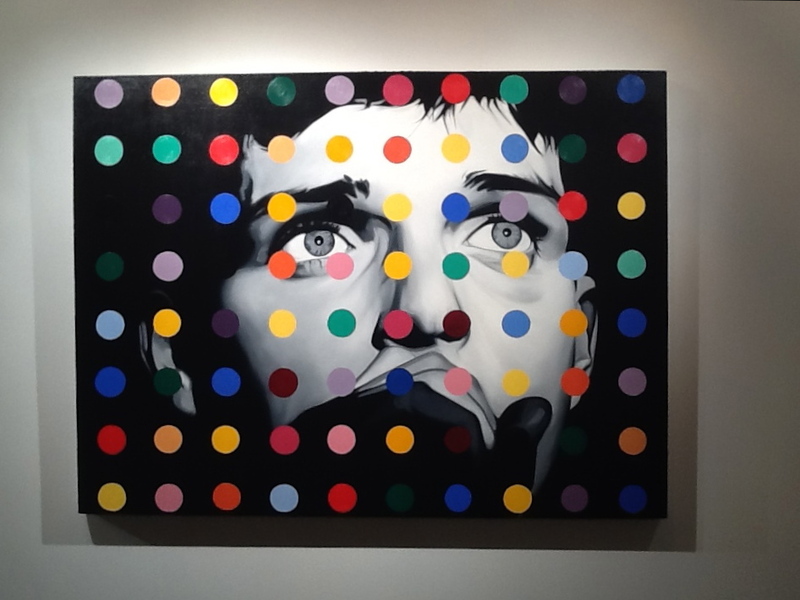 That Hirst himself is honored in the show is pure brilliance. 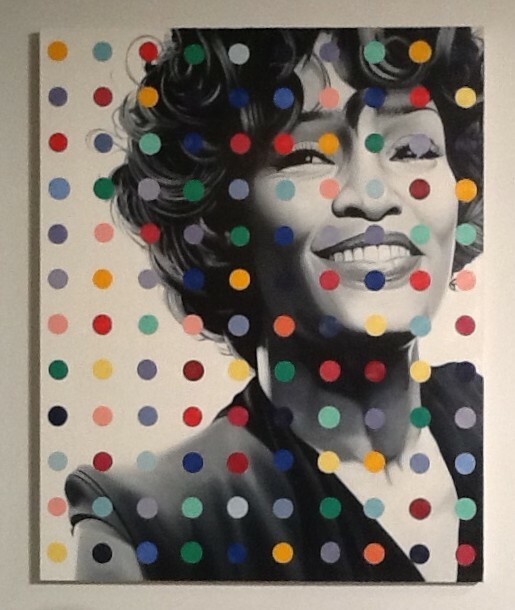 Some of the celebrities featured in the series include Whitney Houston, Truman Capote, Kurt Cobain, Jimi Hendrix, Judy Garland and Andy Warhol. 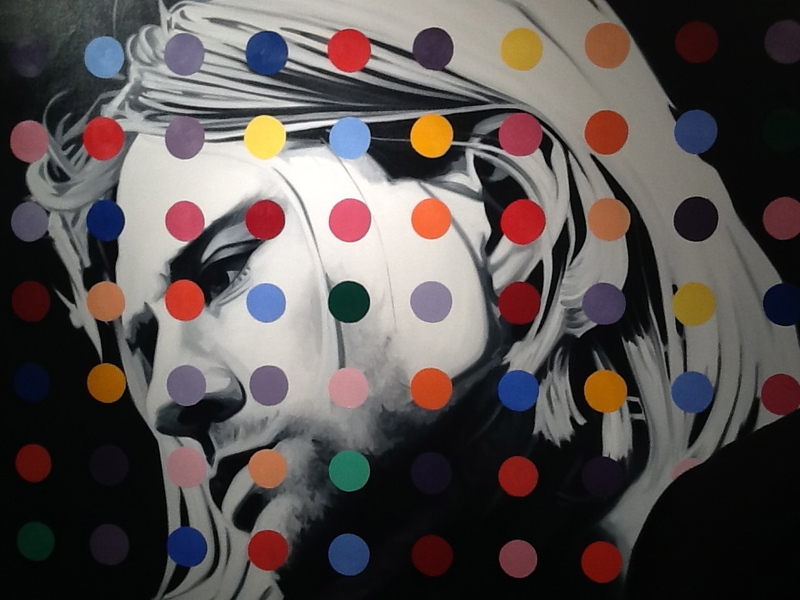 The portraits are borrowed from Richard Avedon and other renowned photographers. He must have had a good time dealing with all of the licensing! 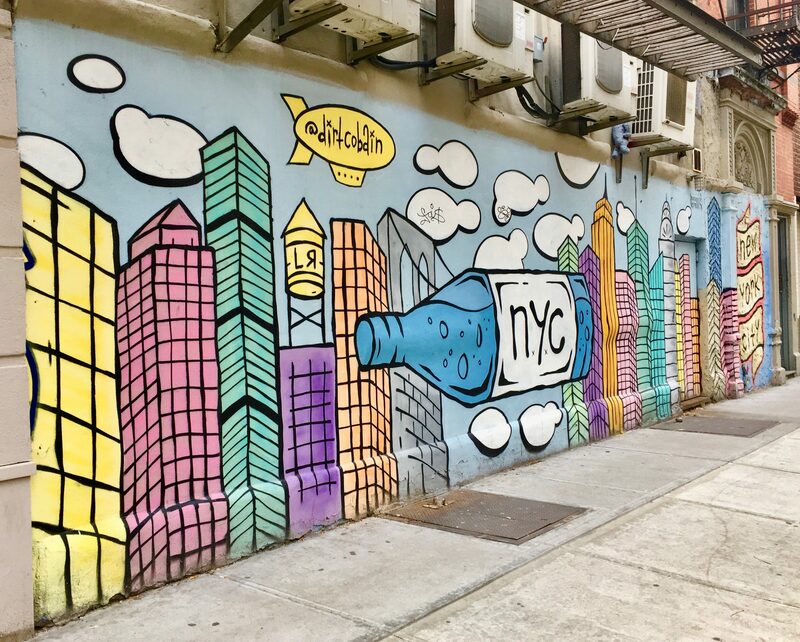 Jim Kempner is the rare gallery that always has a few things going on in addition to their featured exhibit, so drop by next time you are in the neighborhood. 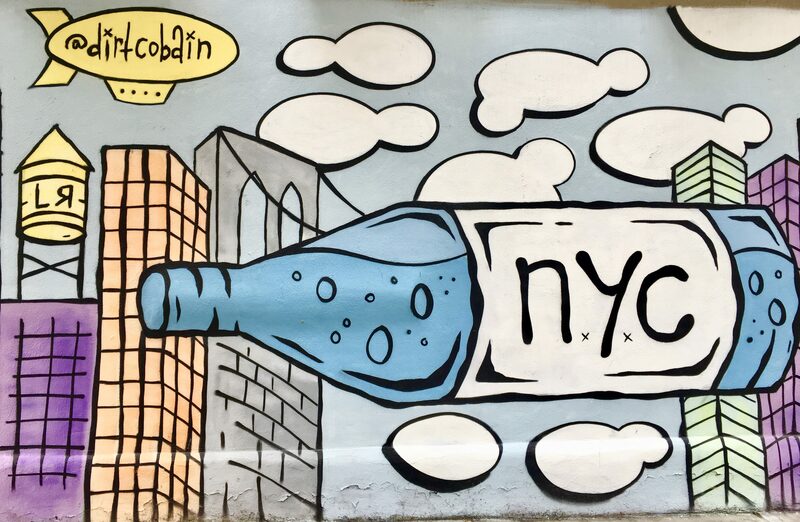 John Grande’s Oh You Pretty Things Will be on Exhibit through February 23rd, 2014 at Jim Kempner Fine Art, Located at 501 West 23rd Street, on the Northwest corner of 23rd Street and Tenth Avenue in the Chelsea Gallery District, NYC. Here’s a crazy fun exhibit that Geoffrey and I literally stumbled on during our recent fall season-launch art crawl: Poster Child, a series of new photographic works by Bruce Pavlow. 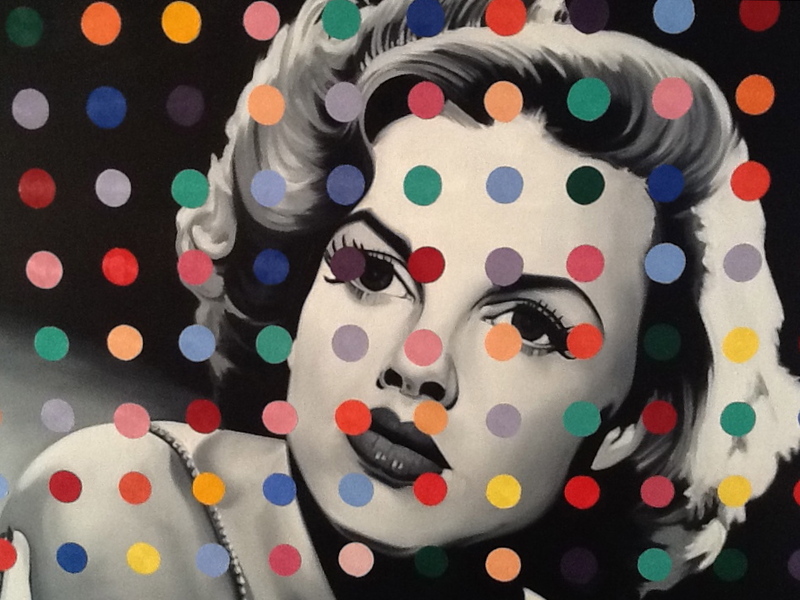 Viewing Poster Child in the gallery is like walking into an imagined tween or teenagers bedroom. 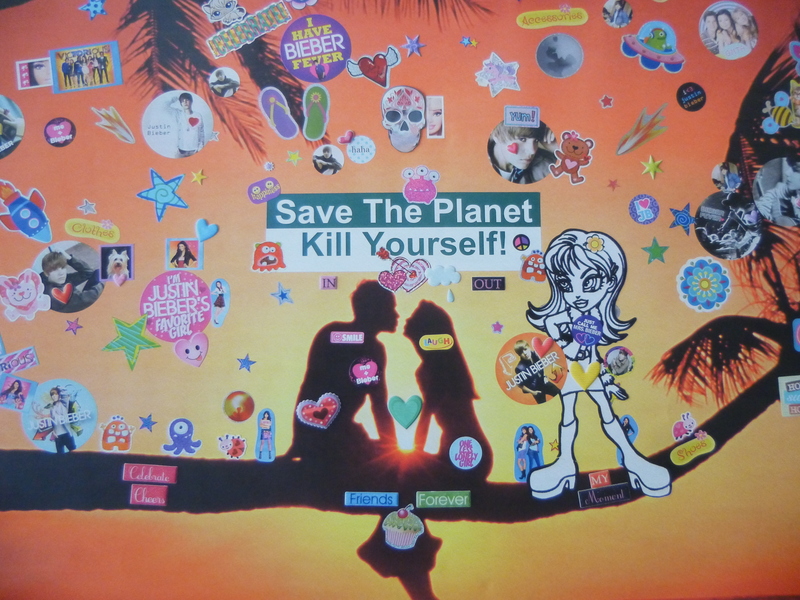 Pavlow has photographed various posters of popular culture icons including bands, pop star pin ups, animals, landscapes and motivational mottos – which the artist asserts have been created by fictitious characters that have enhanced and personalized the images by incorporating ready-made slogan bumper stickers and colorful icon stickers from craft and toy stores. 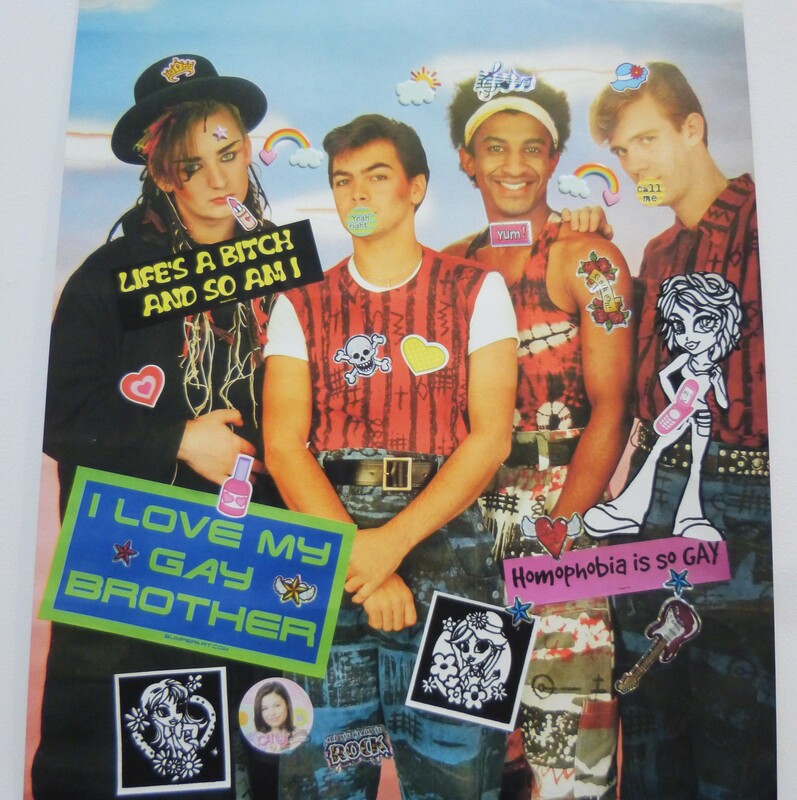 With the embellishment of these memes and slogans, each poster illustrates a personalized narrative and context, reflecting the thoughts and desires of the fictitious characters as well as the culture at large. The re-created posters are then photographed (no Photoshop was used) and digitally printed at near actual size on watercolor paper, giving them a photo-realist quality that amplifies the subsequent transformation. 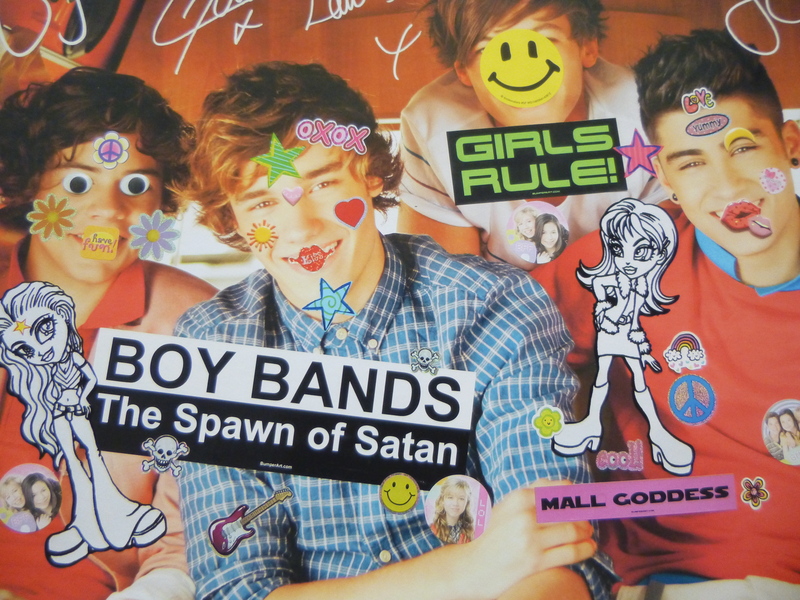 The humor, as you can see is quite sardonic and subversive. Check out Poster Child before it closes! 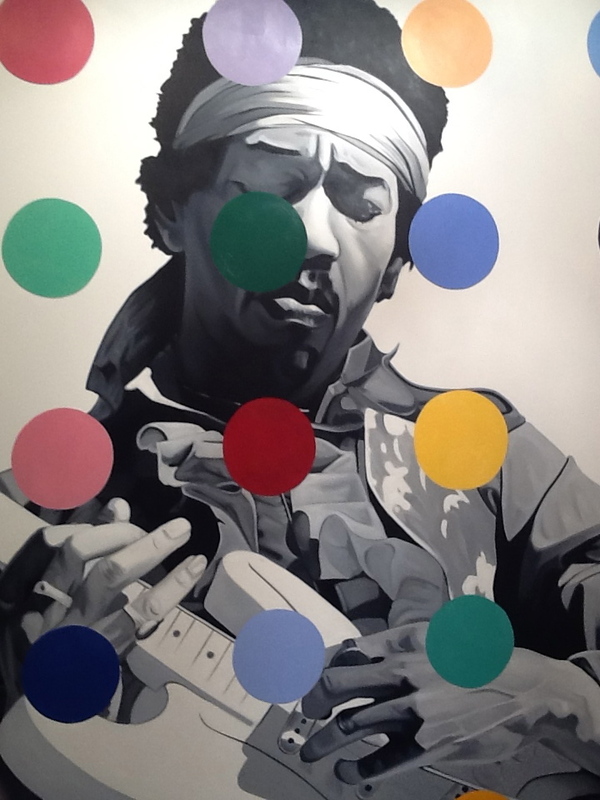 Poster Child By Bruce Pavlow will be on Exhibit Through October 12, 2013 at Shoot The Lobster Gallery, Located at 540 West 29th Street in the Chelsea Gallery District, New York City. 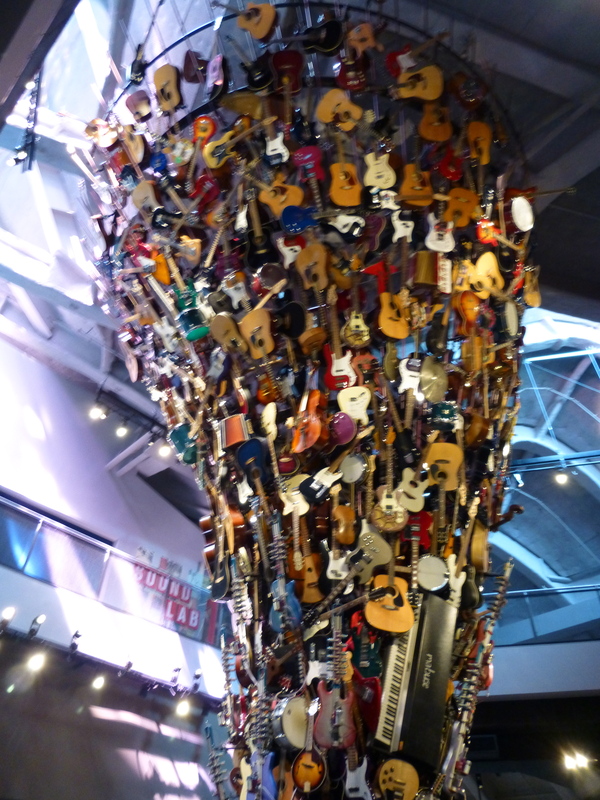 When I was planning my recent four-day stay in Seattle, one of the attractions I knew I couldn’t miss was the Experience Music Project pop culture Museum. 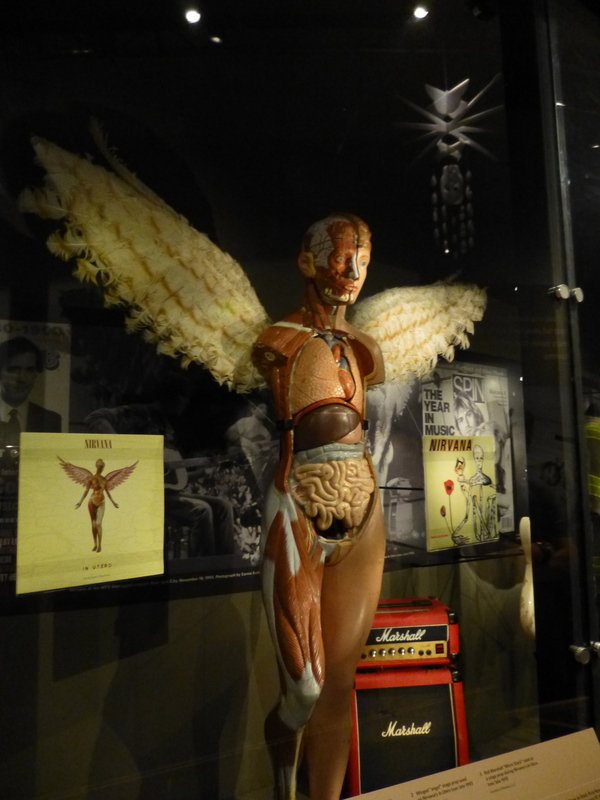 I’ve been curious about visiting the EMP. since it was first in construction, which was about 15 years ago. 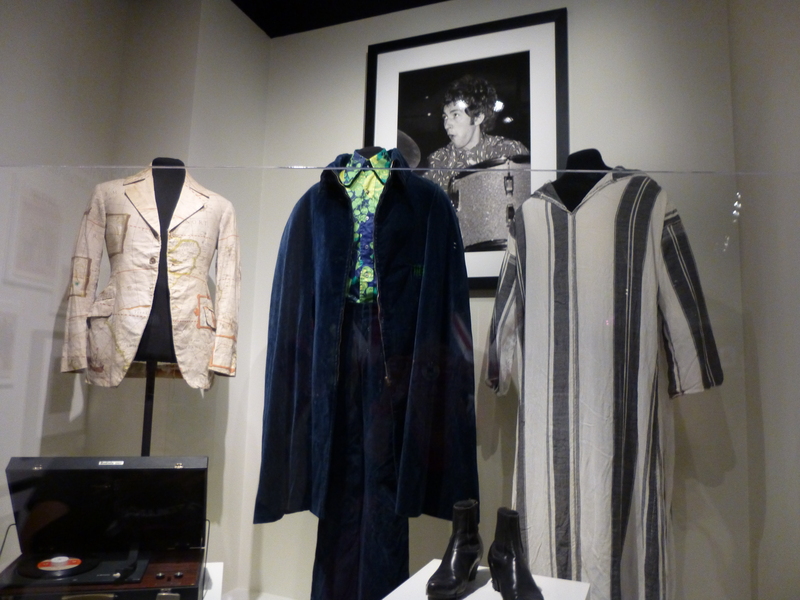 Originally, it’s my understanding that the museum was being built and funded by Microsoft co-founder Paul Allen to house his extensive Jimi Hendrix memorabilia collection. But obviously, it’s expanded quite a bit since that original, rather narrow concept. 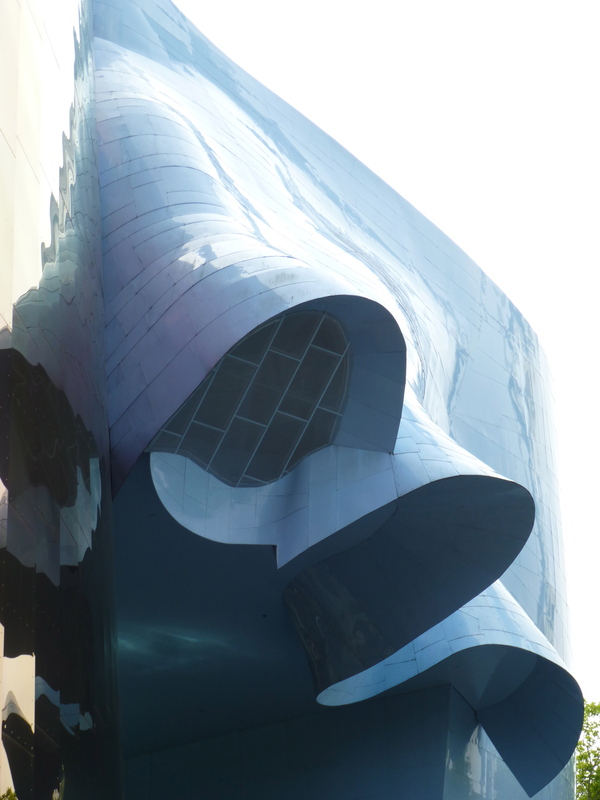 Conveniently located in the Seattle Center, literally in the shadow of the Space Needle, and adjacent to several other top tourist attractions, the EMP is certainly one of the most unusual examples of modern architecture I’ve ever seen. When viewed from the top of the Space Needle, this Frank Gehry-designed structure looks like a Giant took a handful of various boxes of different shapes and colors, and stuck them all together. But this unique approach to modern design has created a fantastic space that provides exhibit halls for not only local music history and an extensive trip down memory lane with the Jimi Hendrix Experience in London, but separate wings for science fiction, fantasy film and literature, horror movies, and the current temporary exhibit highlighting Women Who Rock. Here are a few photos I took during my visit this past July. 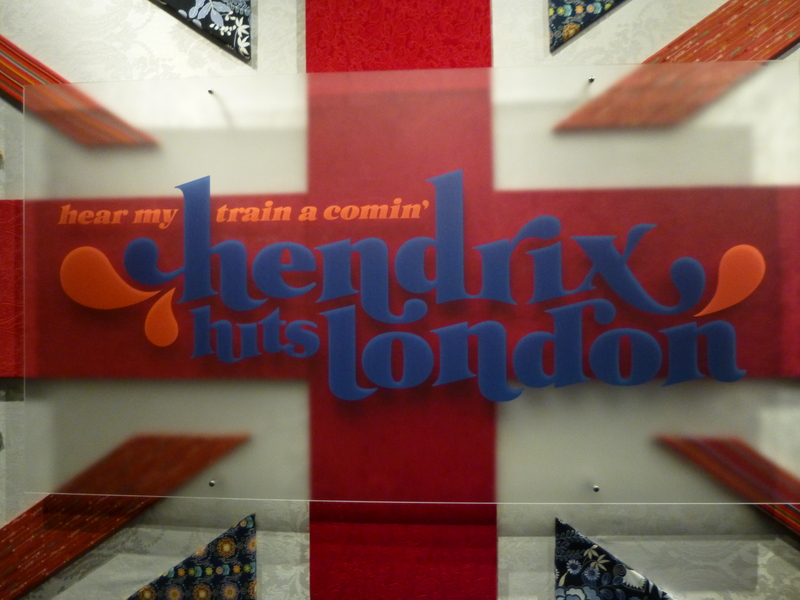 Any Jimi Hendrix fan is going to be blown away by the Hendrix Experience Hits London section, which fills several ground floor galleries. 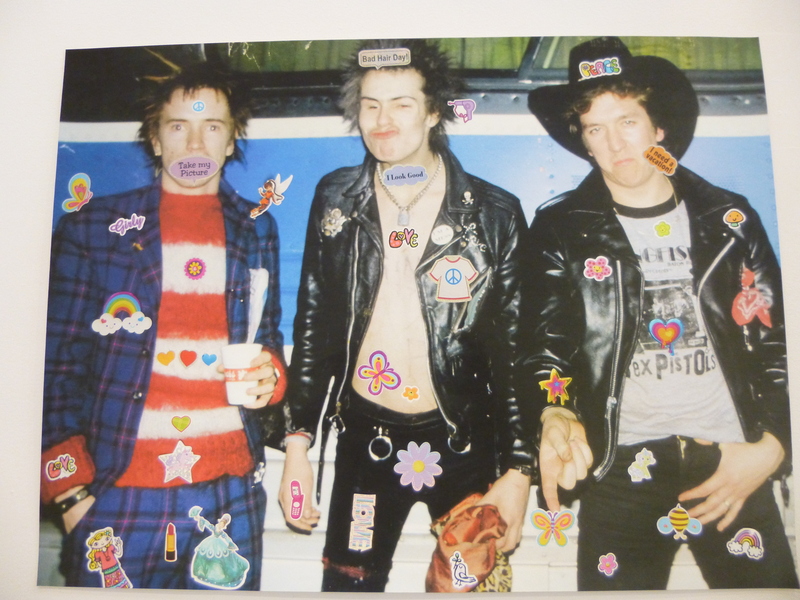 Not only will you see vintage, authentic stage costumes worn by Jimi, Noel Redding and Mitch Mitchell, but the walls of the galleries are plastered with photographs, news clippings, magazine articles, vinyl albums and posters that telegraph the band’s rise to stardom after their initial visit to the UK. All I can say is, it must be nice to be Paul Allen. 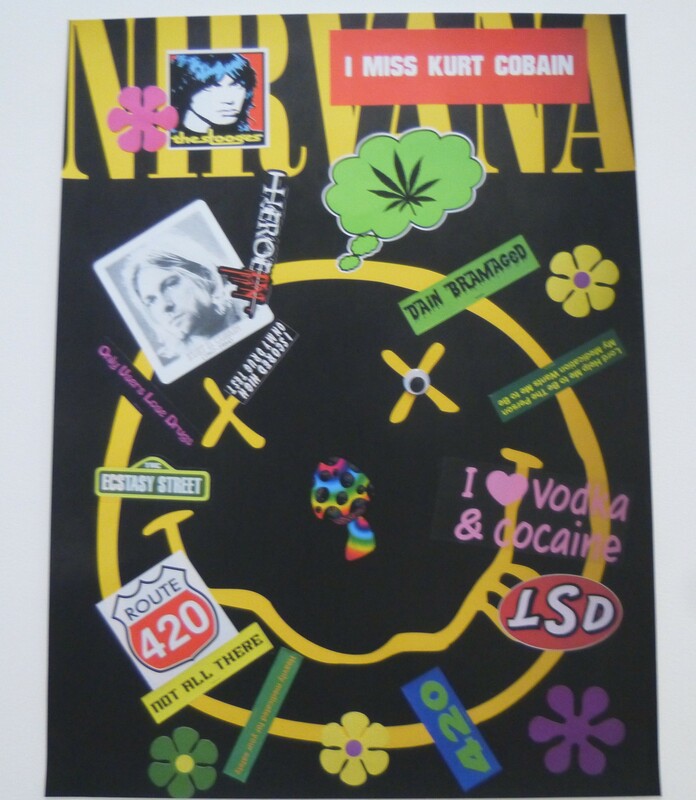 Around the corner from the Hendrix exhibit is an exhaustive documentation of the Nirvana’s impact on the Seattle grunge punk music scene during the 90s. You could easily spend a couple of hours in this section, just reading all about some of the best bands that came from this genre-defining region of the country such as Mudhoney, Soundgarden, Pearl Jam and many other Sub Pop signings as well as projects from legendary genre producers such as Jack Endino. 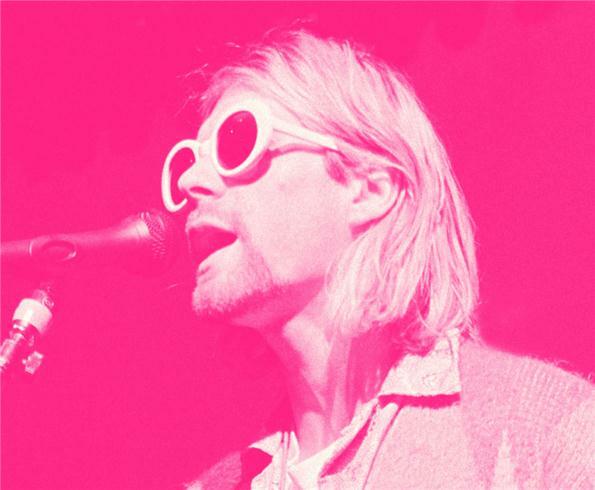 In addition to extensive documentation, Photos, Personal Letters, CD covers, magazine articles, costumes and props, there’s also one of Dave Grohl’s drum kits and other one-of-a-kind memorabilia. 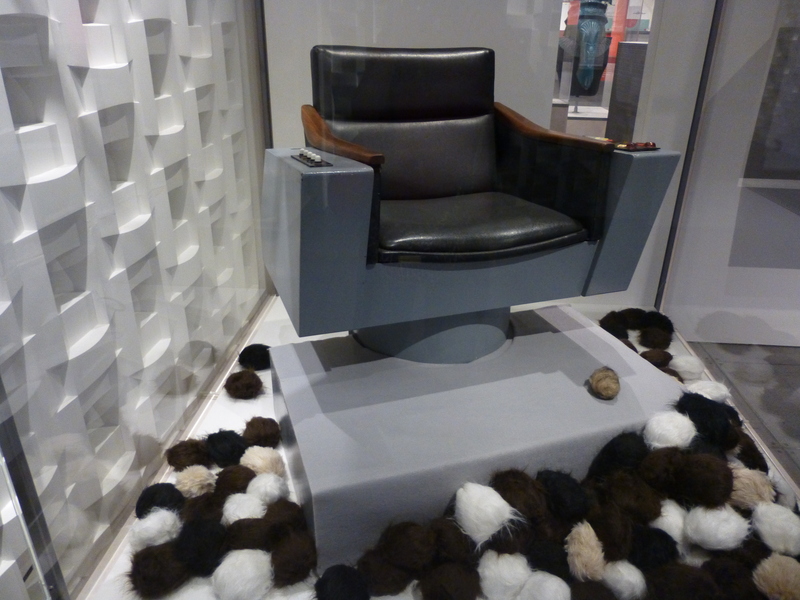 Whoever created this part of the museum did so with a good deal of love. 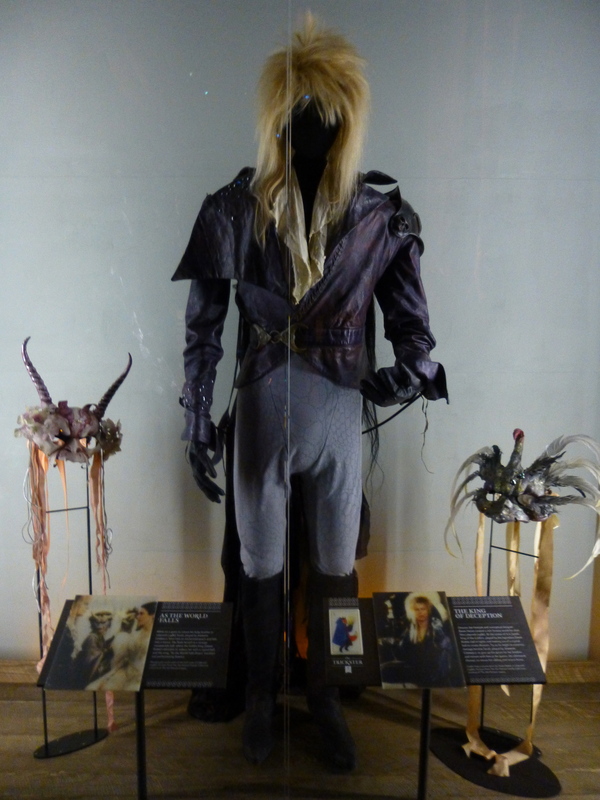 Fantasy film enthusiasts will not want to miss the Fantasy: Worlds of Myth and Magic exhibit where I enjoyed seeing costumes such as those worn by David Bowie in the film Labyrinth as well as many other props and costumes from classic films such as The Hobbit, the Wizard of Oz and Clash of the Titans, to name but a few. 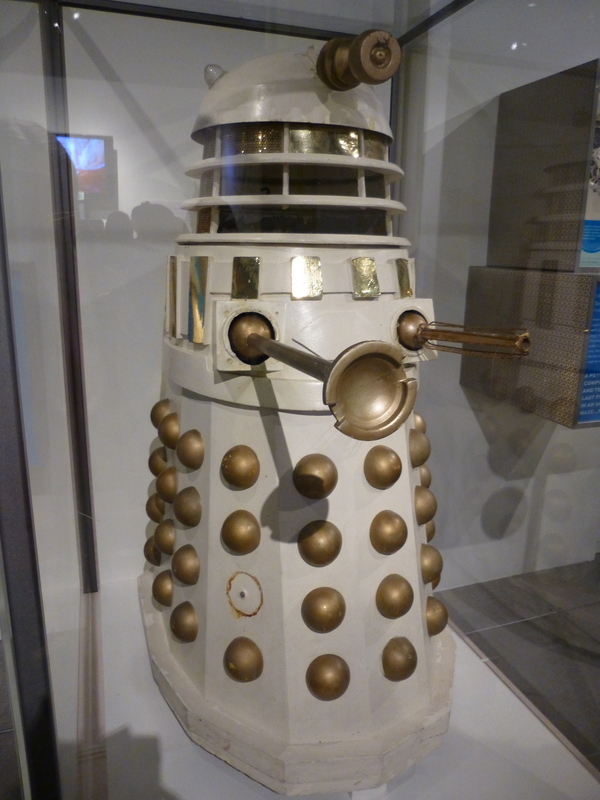 On another floor there’s an exhibit dedicated to Icons of Science Fiction. 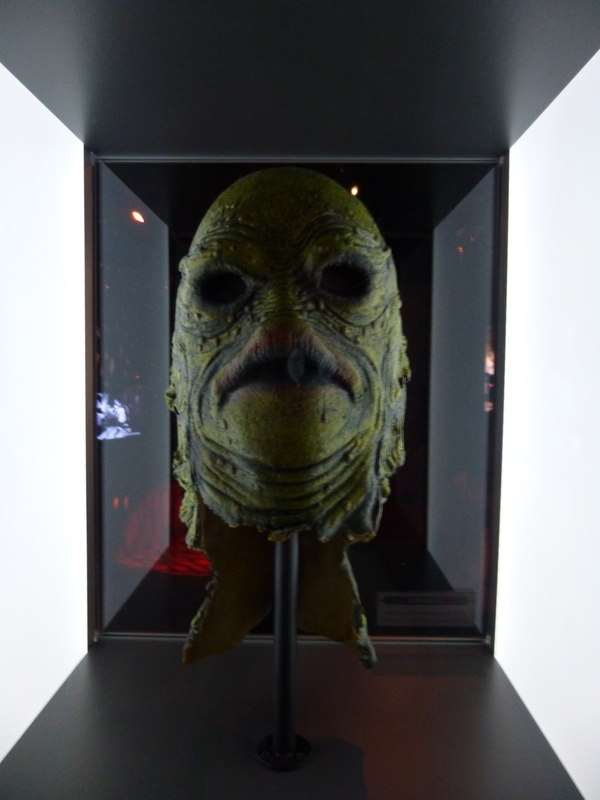 Not only are there props and costumes from science-fiction films, but also there are small exhibits on popular books of the genre that laid the foundation for much of the visual media that came in their wake. 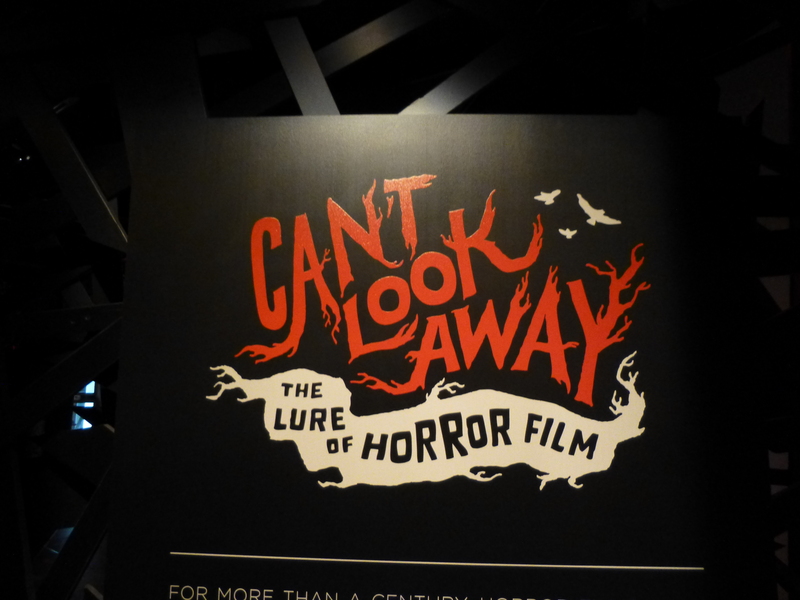 Can’t Look Away: The Lure of Horror Film is also a very fun exhibit. 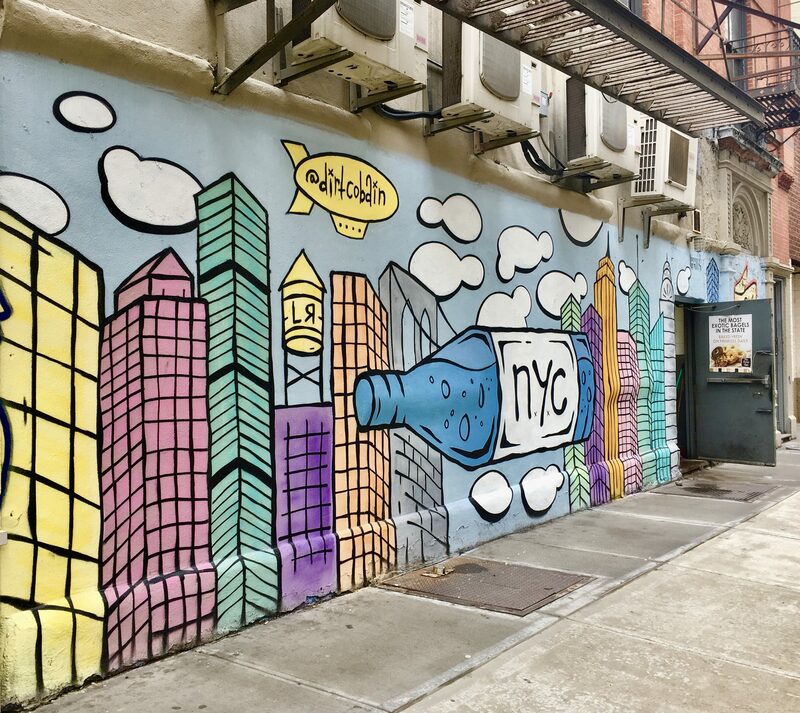 Aside from the expected props and costumes, you can personalize your experience by participating in interactive exhibits including the Scream Booth and Philip Worthington’s interactive shadow monster installation – which is just insane. Rest your weary feet with time spent in a dozen video kiosks where you can sit in near darkness and watch horror film clips (commentary included) curated by directors Roger Corman, John Landis and Eli Roth. Super fun and also very educational! The museum’s top floor is home to a large interactive studio recording exhibit, where you can actually play instruments and record your own music. 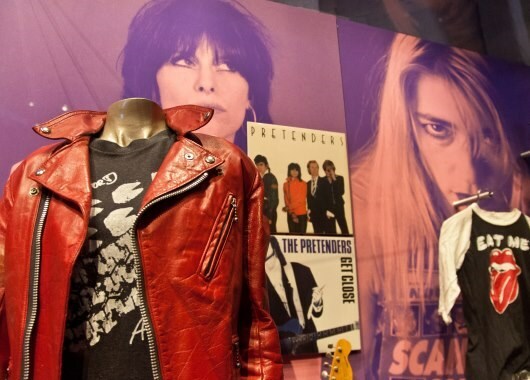 It’s also where you’ll find the museums latest exhibit, Women Who Rock, which just opened in June. Women Who Rock does an ambitious job of documenting female artists from the 50s through to present including pioneers such as Brenda Lee, Leslie Gore, Loretta Lynn, Ronnie Specter and many of the girl groups through to the punk rock movement, groundbreaking all-female rock groups such as The Runaways and The GoGos and on to superstar solo artists from Madonna to Shakira and, of course Lady Gaga. Unfortunately, my camera battery ran out just as we were entering this particular exhibit, so the only photos I have are ones I pulled from EMP’s website. 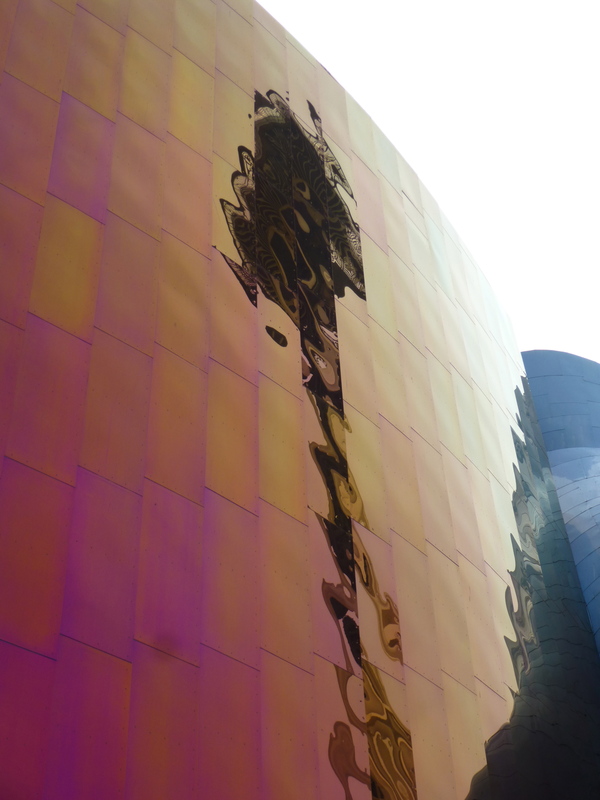 The Experience Music Project is a must-see destination for any music and film fan’s trip to the beautiful and vibrant city of Seattle. 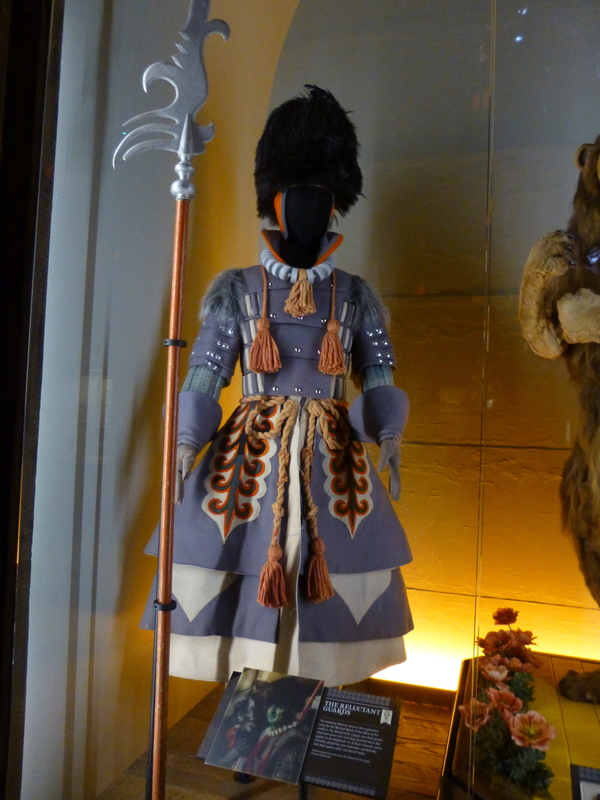 Exhibits change from time to time so make sure you consult the museum’s website to find out what they have in house during your planned visit. 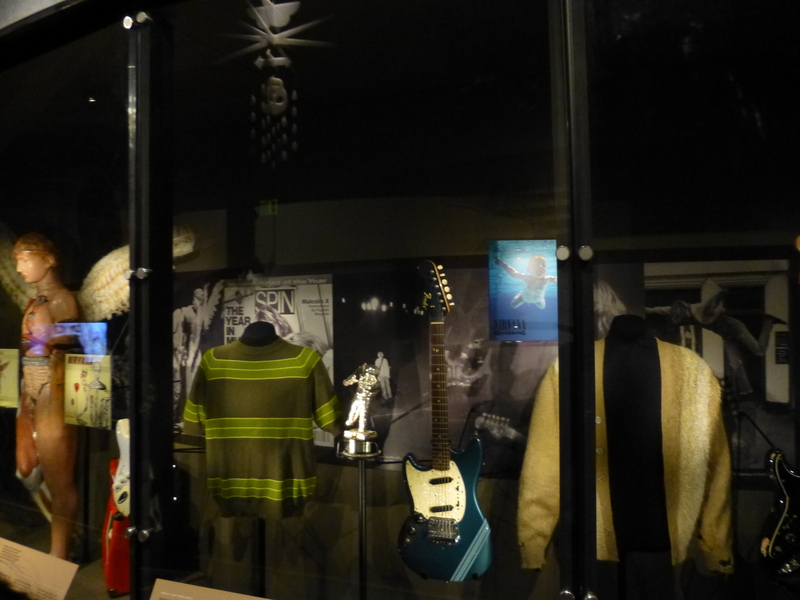 The EMP Museum is located at 325 5th Avenue N, Seattle Center, WA, convenient to the Seattle Center Monorail. Hours are 10:00 AM to 7:00 PM Daily. Visit This Link for additional exhibit schedule and admission information. 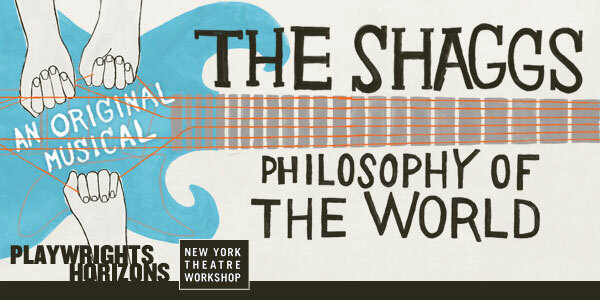 Shaggs: Philosophy of The World Comes to the Off Broadway Stage! As art imitates life, the play tells the story of a working-class dad’s a vision of rock-n-roll destiny for his three talentless daughters, convinced that they are his family’s one-way ticket out of hardship and obscurity. Shaggs: Philosophy of the World is directed by John Langs, coproduced by New York Theatre Workshop and South Ark Stage. The book is by Joy Gregory, music by Gunnar Madsen, and lyrics by Gregory and Madsen. Personally, I can’t wait to see it. For two evenings in April, curious Shaggs’ fans can sneak a peek of the new musical, prior to its May 2011 debut at New York’s Playwrights Horizons. On Sunday and Monday, April 17and 18, excerpts will be performed at the Guggenheim Museum (1071 Fifth Avenue at 89th Street) at 7:30 PM. Irwin Chusid will also moderate a discussion with members of the production’s creative team. It should be a good time. Tickets for this event are $30 General Public, $25 Guggenheim members and $10 for Students under 25 with valid ID. Click through to This Link to purchase. 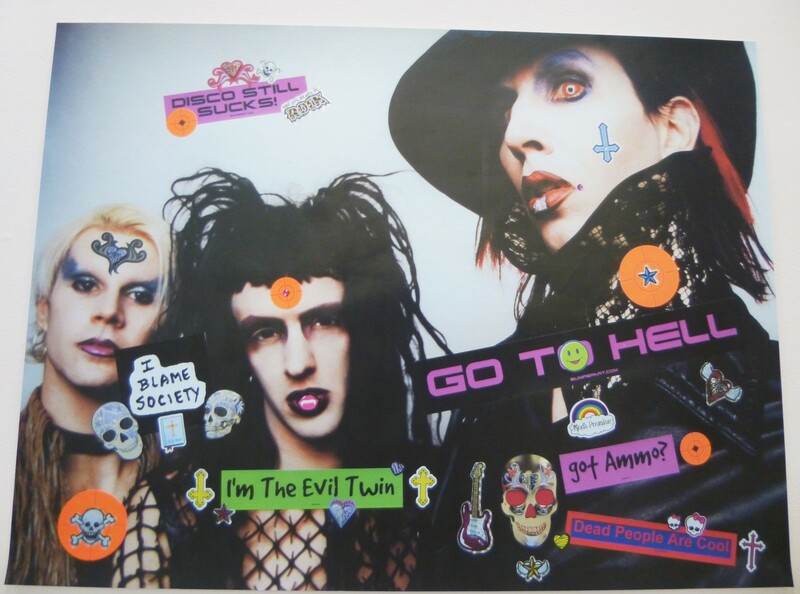 Courtney Love really deserves to burn in Hell for allowing this to happen.